Good to hear you’re going to participate in the Ajax Camp at ‘De Toekomst’ next summer. Have you ever participated at an Ajax Camp before and how do you know the Ajax Camps? This is the third time that I’m going to participate at the Ajax Camps. Last year 2 friends of mine also participate and we went with 3 fathers and 3 girls to Amsterdam an unforgettable experience. Unfortunately they couldn’t participate this year, because of the dates. I knew about the Ajax Camps by searching on the Internet and when I once participated I wanted to come back. At which club do you play football in Norway and how often a week? I play for Skeid in the Girls 13/14 and I train 1 time a week with de boys of my age. Sometimes I play games at Stabæk in the Girls 15 and I also play in the regional team of Oslo for Girls 13, where I’ve been scouted for. Totally I train 5 times a week and also play 1 match, so I`m the all the week busy with soccer. What is your favorite Ajax-player? Kasper Dolberg from Denmark, because he`s a Scandinavian soccer player and I think he`s extremely good. He makes beautiful goals and is a real striker. Currently the World Cup is on. Which country and players do you support? I support Brasil, because Neymar is playing there. I`m also a fan of Lionel Messi. My favorite soccer player in women team is Ada Hegerberg, because she’s the best player in the national women team of Norway. She plays at Olympique Lyonnais and I love to see her actions and goals. Don’t you support Denmark, because it is also an Scandinavian country? No, despite the fact that Dolberg is my favorite Ajax-player is the rivalry between Norway and Denmark to high. You can compare it like the rivalry between Holland and Germany. Do you also see games of the Norway womens team? 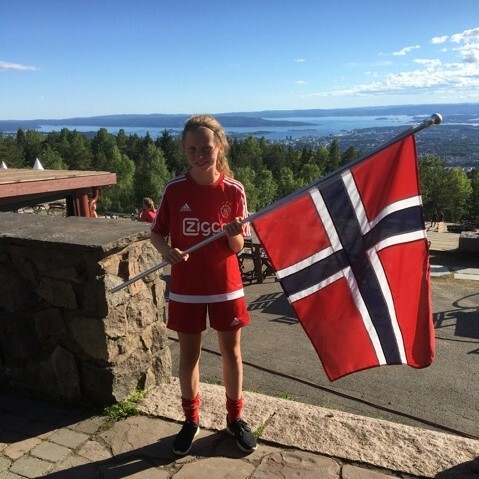 Yes, last summer when we were in Holland for the Ajax Camp we went to the game Holland – Norway. This was the first game in the group phase from the Women European Championship. Holland won with 1-0 and the finals of the European Championship. Unfortunately Norway didn’t pass through the group phase. Wat do you expect from the Ajax Camp next summer? I hope to experience an unforgettable week, where I learn a lot from the trainers and the other participants. Also I would like to make new friend. I look forward seeing you this summer!